Posted by Jon in Rehomed on Sunday 11/06/2017 01:06 UTC. Description: Hi! My name is Stormy and I am around 1 year old. I am a chinchilla mini lop buck. About Me: I arrived on the 12/11/16 after a concerned member of the public found me as a stray. With no microchip to return to my owners, it was very lucky I was found otherwise I could of been fox chow! Temperament: I am a active and nosey rabbit. I love to go out into my run and have a good binky or climb on the tubes. I do HATE to be picked up and often struggles and nips. I am a very smart rabbit and is good at finding escape routes. I love human interaction on the ground and likes to throw my toys about. General Health: I have been neutered and am currently up to date with my vaccinations. I have a very good appetite and am in good health. Type of home wanted: I am currently an outdoor rabbit but I could be a house rabbit too. I would need to be rehomed to someone older, teens to adult due to my skittish personality. I do like to move my own furniture in my hutch, which the volunteers call a mess but to me its perfect! I'm not much of a digger however, I am an escape artist. In fact, I must of been a magian in my past life I'm that good at it. I need to be rehomed to a doe around the same age as me and with the same kinda personality. Adoption Fee: To help the charity cover the costs of neutering, vaccinations and housing costs. We ask for a minimal donation of £55 for Stormy. If you think you can offer Stormy a "furever home" please do not hesitate to contact us using the details below. We are not open to the public and viewing is by appointment only. For the welfare of the rabbit we ask to do a home check or if you live far ( out of 15 mile radius from NG16 5AX) Please email us a photo of your set up ( quicker) or bring one with you to the appointment. What we look for is sufficient space. At minimum a hutch at 6ft x 2ft x 2ft with an attached run of 6ft squared. That the accommodation is fox proof, that the rabbit has a partner and that you'll be able to provide for the animal. Please note we cannot reserve rabbits unless you have seen them in person. Rabbits are on a first come, first served basis. 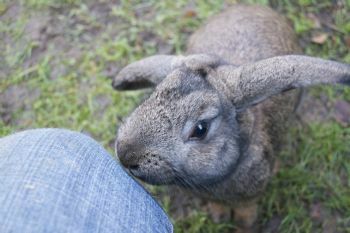 We can only reserve rabbits for a week, otherwise the next interested person gets priority. Unfortunately, we have had many people mess the charity around, please don't add to the number. View more posts in Rehomed or browse all posts.You can follow this story via its RSS 2.0 feed.